See your best little buddy sitting over there? He’s gonna love you even more when you rub his little paw pads with this salve. 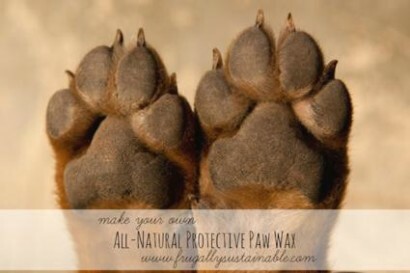 Doggy paws – and outdoor kitty paws – take a beating out there in the wild, even if it’s the wilds of suburbia. Make this salve and apply it to not only soften up those rough little pads, but also protect them during future outdoor excursions. Frugally Sustainable also discusses different herbs and oils can be added to provide a variety of other kinds of relief to your pets’ paws.